Comfortable day pack with good balance, a built-in rain cover and a great vented back panel. This pack is IT! I bought it more than two years ago from REI in San Francisco. I am a plus size woman, 5'8" tall. I needed a pack that fit the bill for my upcoming Everest Base Camp Trek. I was fitted by the employee at REI who was an experienced back packer so I was thankful for his help. This is not the woman's version but it fits fantastically for my torso and hips and ....well....EVERYTHING! The hip belt is very comfortable with foam extending about to the actual point of my hip bones. As a larger girl, I do have more out in front and it worried me that it might not be comfortable, but I soon learned that the padding was right where it needed to be. I love the adjustable straps and can pull in the pack close to me when the load is lighter and that helps prevent shifting and bouncing. I can loosen the same straps for additional venting on hot hikes....a real plus here in the Mojave desert around Las Vegas. The volume is good for putting the essentials for the day. 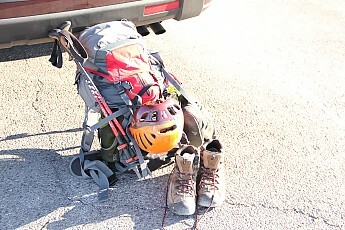 I have rain gear, camera, climbing harness and shoes, helmet, first aid kit and can strap my climbing rope over the top. You can see here the pack's rise is great for day hiking and not having an obstructed view. Laying the rope over the top does not overload the pack and sits there well. I like the side pockets to hold bars in and smaller items. I also like the top pocket to hold blister kit and other first aid items that I might want to grab quickly. As you see, poles are right at my side and there is a strap to pull tight around them (same one that pulls the pack in to your back when toting smaller loads). When I have this pack full I feel it is pretty stable. So long as I don't put my heavy camera on the very top, the balance is so good that it is just THERE and does not feel top heavy, even on quick scrambles. The claps are as durable as any with the hard plastic. I have not treated this thing gingerly. It made the trip all the way up to Mount Everest Base Camp and back. It endured two cross pacific plane flights. 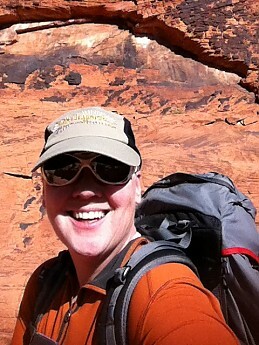 It has been all over the Red Rock canyon on hikes and climbs. My only complaint is that there are no pockets on the hip belts and the velcro attachment that holds the bladder up in the pocket is not a great design...the bladder can slip off if you move around a lot. Just does not seem to be designed to be compatible with the top of a Camelbak bladder. I love this pack. I will use it until it dies on me. 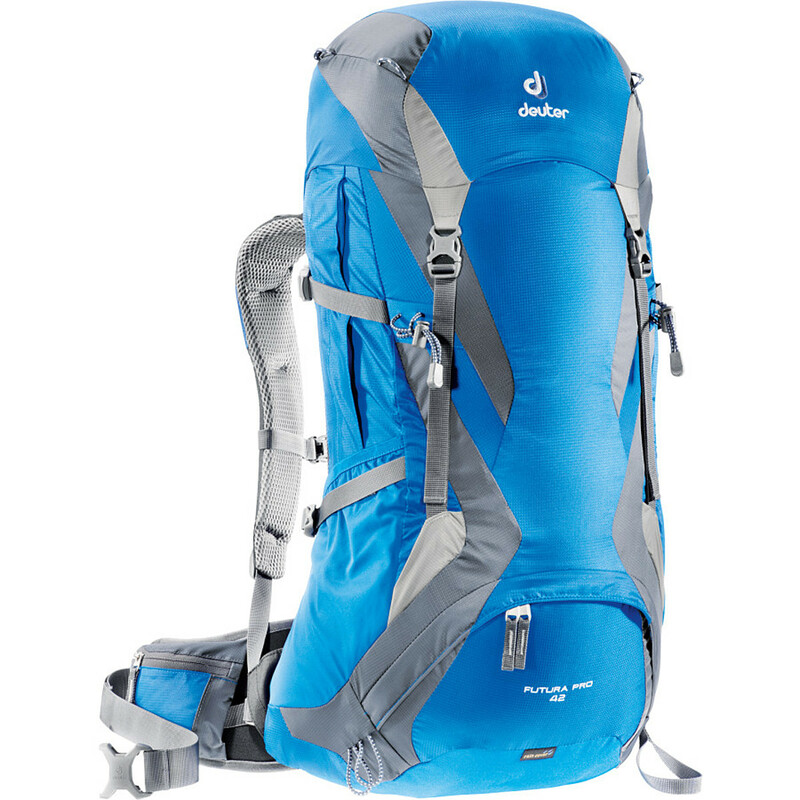 If I need a bigger pack, I will look at Deuter first. That is how perfect this pack has been for me. It is 2014 and I continue to use this pack. It has not been outdone by anything to date, including the REI Outlook 40. My friend gave me another a couple years newer. The only changes were the front pocket on the main pack is at a different angle and the color is changed by a shade or two. 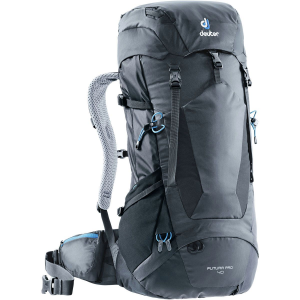 I just bought the Deuter Futura SL30 (women's) for an upcoming trek. I will review that in the fall and compare the women's fit and finish with this then. It also goes so well with that Trailspace hat! Great weekender backpack with incredible organization and storage possibilities. Mesh AND zippered pockets on the side, waterproof zippered pocket, top compartment, bottom compartment with the rain cover (included) and the inside zipper connecting bottom half to top makes this an ideal backpack for anyone obsessed with storing things right. This was my first backpack as I ventured into backpacking territory. As soon as I took it off the hook at the store, I realized that my Futura and I would go many places and I would always know where I stored things. This backpack has so many pockets that they warrant a list! Side mesh pockets: Big enough to take a Nalgene, I usually keep my flip flops / CamelBak insulated bottles. Side zipper pockets: Store sunscreen/snacks/maps for quick access without rummaging through the main pocket. Waterproof zipper pocket: While not accessible without putting the bag down, I use this pocket to store my car keys / phone, things I won't be using until the end of the hike. For rainy weather, I also store the map in there. Top compartment: Only accessible pocket without taking the backpack off, I store my camera/sunglasses/other things I might need to access without stopping. Inside pocket at the top: Store stuff you won't urgently need, but still wouldn't want to open the whole backpack for. Also has Alpine signal chart printed on it. Rain cover pocket at the bottom: If it's a dry season, I put my groundcloth in here instead of the rain cover, which gets compressed by everything else in the backpack. Sleeping bag compartment: Nicely positioned right below the waistline, big enough to store a synthetic sleeping bag in a compression sack. Bag is designed to make sure your sleeping bag is not going to cause anything else to displace. Main compartment: Has a bladder pocket, and big enough room for tent, food and clothes bags. Side cinch straps: I store my Z-Lite pad, and rolled up tarp. Hiking pole/axe loops: Comes with cinch straps at the top, and two loops at the bottom to keep the poles snug to the backpack. I've done up to 3 days with this backpack, and everything I needed fit well within. I was at around 35 lbs and it carried with grace. Because of the pockets, nothing needs to be hanging outside the backpack, so I never had to worry about trees snagging things off it. I've used it as a pillow, as foot rest, as an emergency sled, and it held up to everything I can throw at it. If it was a little bit lighter (or I could take out the back support), it would be my UL backpack as well. 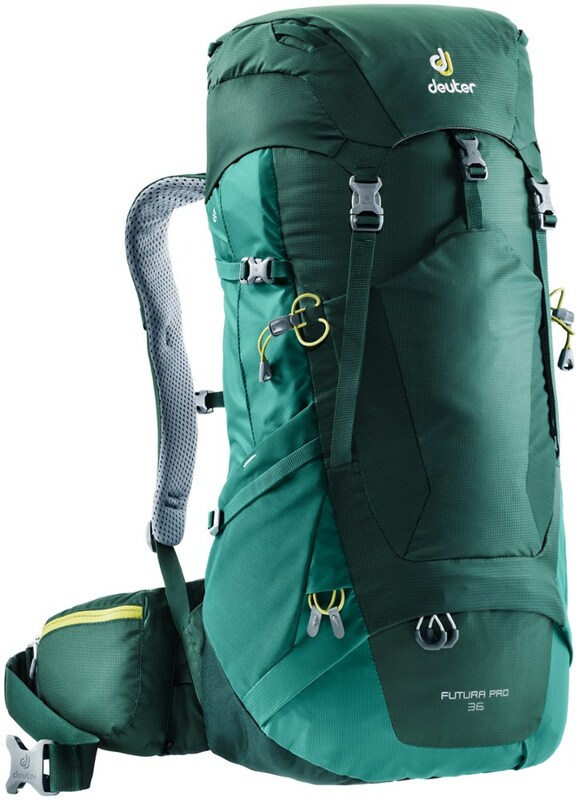 As far as comfort goes, everything is adjustable, and Deuter has a taut mesh panel that keeps the backpack away from your back, which allows for ventilation and weight distribution, means you will never get the sweaty back from carrying this guy. 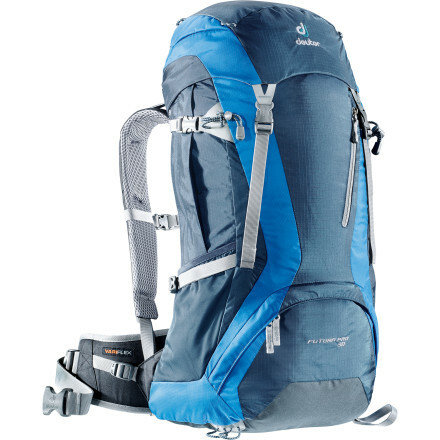 At the price, weight, and volume, this pack is a winner and I recommend it to anyone who's looking for an entry backpack. Purchased in 2009 and used everyday while working seasonally for the USFS (six years). 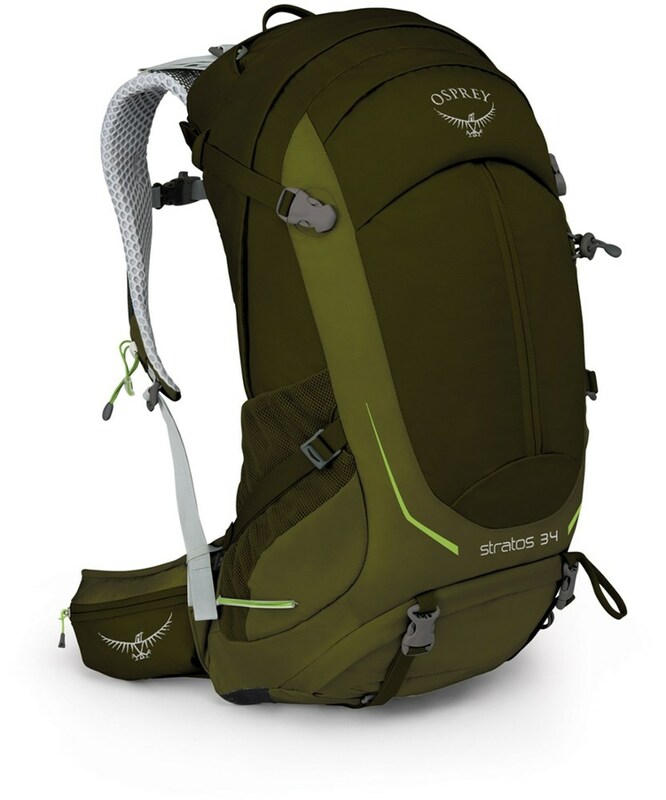 Pack is bombproof, no popped zippers, no torn seams or ripped attachments even while it was way overstuffed and used to carry trail maintenance tools. Space between "air frame" and pack body. Used this pack for over 160 days a year for over six seasons in the Nez Perce NF with the US Forest Service without a lick of trouble. Held its shape even when stepped on by a pack mule. The pack was very comfortable to wear and my back stayed cooler than the traditional bag type pack. Had plenty of attachment points to tie in gear and tools. Mesh side pockets are large enough to hold two 64 ounce "recycled" square juice bottles. The pack's curvature did pose some capacity and balance issues as I was out for 7 to 9 days at a time with tools tied to the outside, so go figure. The built-in rain fly was especially appreciated. Shoulder straps and belts are fully adjustable. Pockets are easy to access and zippered barrier sheet between sleeping bag and main compartment is convenient when carrying a bulky low temperature bag. Pack is now retired and so am I, but it still sees a lot of trail action from Washington state to California, Idaho, Arizona, Utah, and NM. Welcome to Trailspace, Elk City1! Thanks for sharing your first reviews with us. I have also been impressed with my Deuter packs. Sounds like yours served you very well. If you happen to have any pictures of it, I'd love to see them in your review. Don't let the lesser known name scare you. This pack is amazing. 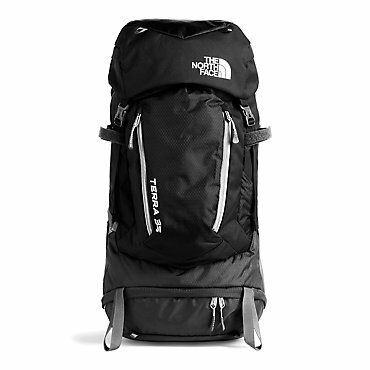 I have used this pack on many trips since purchasing, ranging from the White Mountains in New Hampshire to Zion National Park in Utah. The pack is bomb-proof and very comfortable. It works great as a daypack and overnight pack as well. I have no issues fitting everything into it for an overnight trip. The weight is distributed evenly and the pack is very stable. Plenty of storage options but nothing that's unneeded. My wife and I often fight over who gets to use it (she'll be getting her own Deuter pack soon). The water bottle pockets on the side are almost impossible to reach with the pack on. I tend to use a Camelbak but also carry water bottles from time to time. Although it's annoying to take the pack off, it's hardly a reason not to get this pack. The pocket on the front of the pack is pretty much useless. It's too small to fit anything but a map and compass and even at that, it's a tight fit. Overall a great pack. I will be buying Deuter products from now on. I am an amateur photographer and when I recently decided to get back into backpacking, I realized that my Lowe Pro was woefully inadequate. I spent considerable time and effort trying to figure out how I was going to carry my expensive camera gear into the mountains. The camera backpacks are a joke, as they are heavy, expensive, and in no way a professional backpack. Therefore, I needed something that would do what I wanted and that was to have the photo gear easy to access. The DFP42 has the bottom compartment that allowed me the access to my photo gear without digging into the main compartment. However, it was just the right capacity to carry a jacket, food, and water…something that dedicated camera back failed to do. I have to say that the other feature that I liked was the mesh ventilation, as I guarantee you that a camera backpack would make your back soaking wet in short time. The other problem I had was being able to carry a tripod. The DFP42 also solved that problem nicely because of the two heavy straps that hold the top cover down. I simply pulled the straps over two legs of the tripod (spreading them apart first) and snapped them together, the result being that my Manfrotto tripod lay perfectly on the upper part of the pack. Trust me…not many of the other backpacks packs have this ability. I need to point out that my tripod weighs over four pounds, and hanging it off a lanyard or elastic straps would have eventually damaged the pack. I found some sterlite food containers, called the Ultra Seal, which are virtually waterproof. One held my DSLR camera with a lens, and the other two held more lenses and a flash. They fit perfectly, although tight, into the bottom compartment. I made a first trip with the pack and gear, and hiked up into the Colorado national forest on a moderate trail, the Big South Trail, along the Poudre River. (Stunning hike by the way) The pack was awesome, and even though the upper compartment was almost empty, it was a joy to carry. The flex waistband, and the ventilated mesh back was great, making the pack was super comfortable. I know that with the extra space, I will be able to carry my tent and food by going light on the other gear. That said, I also plan to get a different tripod, a Benro C-068M8 Travel Angel Carbon Tripod, which is only 1.4 pounds! Sorry to go on and on….but if you carry photo gear, this is a great pack! 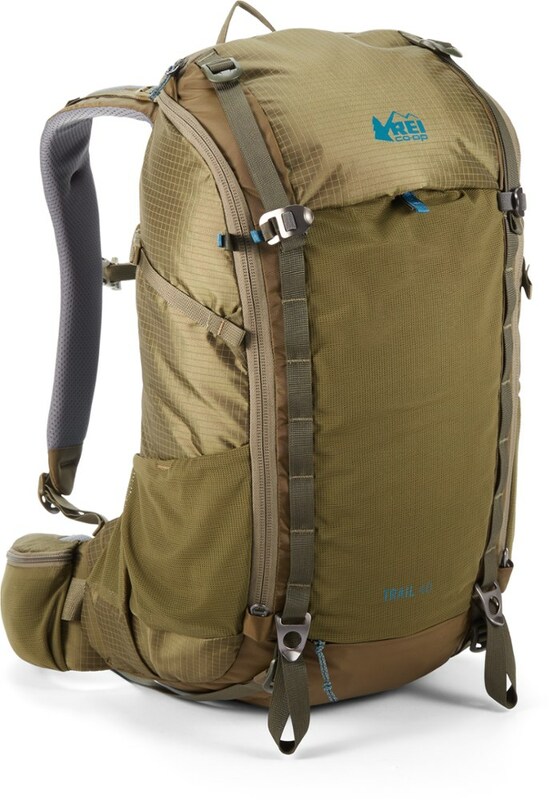 This is a great pack that does everything that it promises. There are plenty of spaces that you can store gear. I love the options that this pack allows. Plenty of little stash pockets for keeping misc. items handy. The curve in the pack is taking some getting used to. It looks funny when it is on, but it still feels balanced and manageable. I am looking to put some more hours on it before I make a final decision on the pack, but initially, this pack seems outstanding. The Deuter Futura Pro 42 is not available from the stores we monitor. It was last seen August 4, 2018	at Massey's Outfitters.